For recent Trisha boutique launch in Hyderabad,Kajal aggarwal donned a yellow color traditional silks saree with elbow length simple blouse.Side swept wavy hair,pearl chandbalis and pearl bangle completed her look. Model Shamili in multi color collar neck elbow length blouse for silk saree. For a recent interview,Kangana ranaut donned a ilovepero vintage floral print saree with plain sleeveless blouse.Styled by Ami patel. She looked simple and beautiful. For recent Malabar gold and diamonds showroom launch in bengaluru,Tamannaah bhatia donned a shehlaa khan floral design net saree with sleeveless plain blouse.She completed her look with malabar diamond jewelry. 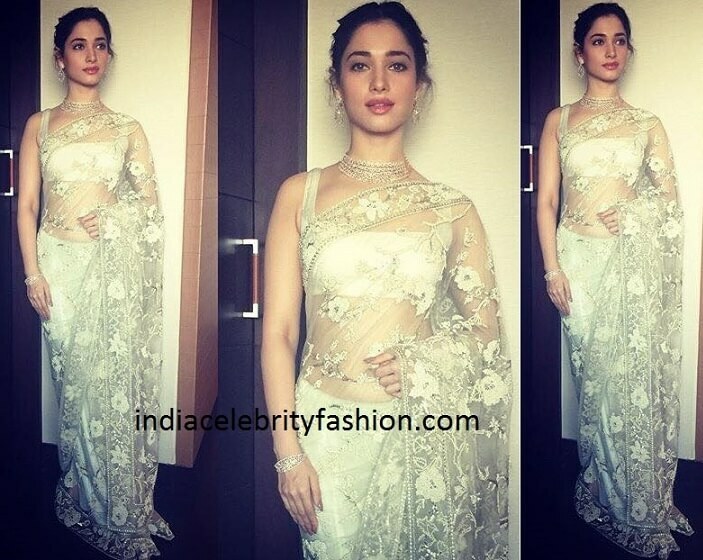 She looked chic in sari! Tv anchor and actor Sree Mukhi launched manvis salon in hyderabad in a light pink color saree with contrast blue color lace work cut back blouse.